The extreme contrast in this view of the unlit side of Saturn's rings is intentional. Contrast-enhanced views like this are used to look for spokes (the transient, ghostly lanes of dust seen in NASA Voyager and Hubble Space Telescope images), but so far, none have been seen by Cassini. The apparent absence of spokes is thought to be related to the Sun's elevation angle above the ringplane, which currently is rather high. As summer wanes in the southern hemisphere, the Sun's angle will drop, and spoke viewing is expected to become more favorable. 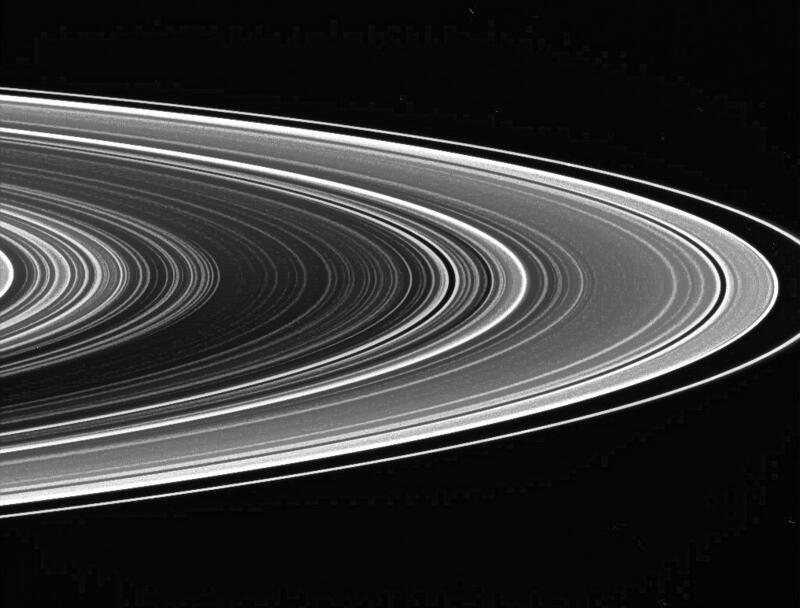 In unlit-side views, the denser ring regions (and empty gaps) appear dark, while less populated and dustier ring regions appear bright. The image was taken in visible light with the Cassini spacecraft wide-angle camera on Aug. 3, 2005, at a distance of approximately 781,000 kilometers (485,000 miles) from Saturn. The image scale is 43 kilometers (27 miles) per pixel.